Caroline’s experience working with families in crisis helps her to empower her clients to emerge from their difficult circumstances even stronger. 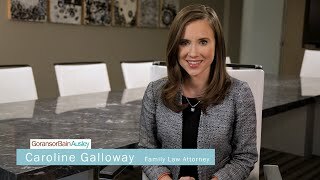 Prior to joining GoransonBain Ausley, Caroline worked as an attorney with the Legal Assistance Foundation of Chicago, where she represented disabled children living in foster care, and low-income families. She assisted her clients with education issues, public benefits, and access to healthcare cases. Caroline also worked as a victim’s advocate at a domestic violence and sexual assault crisis center. As a family lawyer, Caroline knows the importance of understanding her clients’ legal needs and helping them understand the legal process. She applies her training in active listening, crisis intervention, and case management to help clients navigate difficult family law problems. Caroline also uses her experience working with business owners to assist with business interests, division of royalties, and international custody disputes. Caroline is a graduate of the University of California, Irvine, School of Law. She served as Judicial Extern for the Chief Justice of the Indiana Supreme Court, and received a Fulbright-Hays Fellowship to develop and implement a field research plan in KwaZulu-Natal, South Africa. Divorce Attorney Explains What Happens After Filing for Divorce?